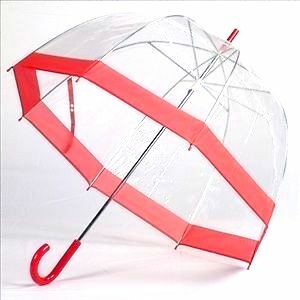 Stylish clear dome umbrella with red trim. Provides complete coverage of your head and shoulders, with clear visibility when your walking. Featuring a red plastic crook handle. Lightweight feel. Durable nylon material. Measures 80cm in length, canopy diameter 86cm. Category: Autumn/Winter Designs, Handbags & Accessories, Spring/Summer Designs.